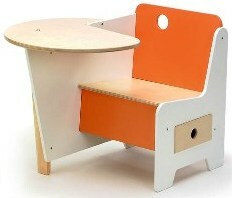 Children's and Modern Childrens Furniture is typically bright and colorful but also needs to be safe and sturdy. Children enjoy bright colors and plenty of stuff to do when in their bedroom but you want the peace of mind and security that comes with knowing that they aren't in any danger. Modern bedroom furniture designed specifically for children incorporates all of these factors and items ranging from children's bedroom furniture sets to individual storage and functional items like book cases, kids storage, and children's tables are designed to be safe as well as useful and good looking. Seating includes items like childrens chairs and sofas, but also funky modern furniture like large Fatboy bean bags that are great for creative playing. 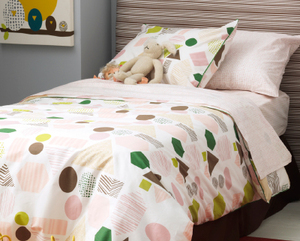 Bright colors and modern designs are generally found on soft furnishings so they can match the character of your son or daughter perfectly. Soft furniture items are also perfect as kids playroom furniture or as children's bedroom furniture. Childrens rocking chairs have been a favorite of children for many generations and while the designs have been updated they remain a popular addition to children's bedroom furniture and play room furniture sets. As well as rocking horses, you can also buy rockers in the shape of motorbikes, cars, or trucks from KidKraft and Levels of Discovery. Desks are an ideal addition to children's bedroom furniture and funky modern furniture includes kids desks with chairs designed for safety and creativity. Modern kids stools and other wooden children's furniture is designed specifically for safe use by children so soft wood with curved edges and rounded corners are the usual style and shape. Kids bedroom furniture for children include kids bunk beds and other storage units but may also include other items. Seating and play are important to children and to you so you can either look for complete modern bedroom furniture sets or buy additional items to match. My Urban Child has a wide selection of contemporary furniture kids items as well as collections and sets so you will be able to find everything you need all on one website. Storage is even more important in a child's bedroom than any other. Toys, clothes, books, and eventually school stuff will all need a permanent and tidy place to reside when not in use. playroom storage, storage boxes, cabinets, drawers, and cupboards can complement the design of your child's bedroom; modern furniture is available in virtually every color, shape, and design conceivable. My Urban Child is a website dedicated to bringing you the ultimate collection of modern bedroom furniture and funky bedroom furniture for children. As well as bedroom furniture, our baby nursery furniture, are also perfect for use in the playroom or kids entertainment centers, providing safety and fun as well as good looks and great designs.